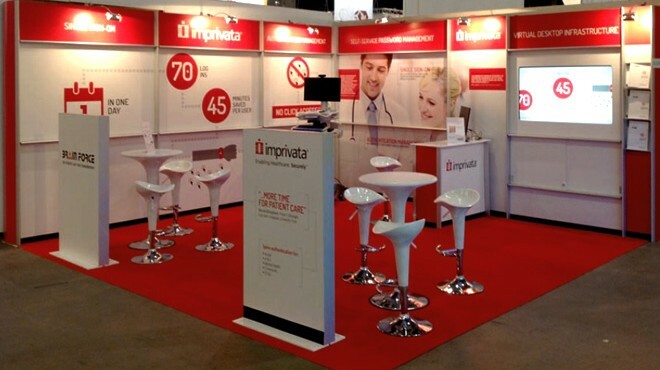 One of our clients, Imprivata, has recently commenced a three-month exhibition tour taking in Utrecht, Gothenburg, Berlin and Paris. And along the way Williams&Crosby will be covering almost 10,000km as we manage every aspect of their exhibition presence for them to ensure they look the part at every location, regardless of the size of their stand space! Imprivata is a world leading IT security company specialising in authentication and access solutions for the international healthcare market. They were looking for a turnkey solution covering every aspect of their exhibition requirements. This included their requirement for an innovative and impactful exhibition stand solution, flexible enough to work in a variety of spaces while offering the ability to change the artwork panels depending on language requirements. The solution that we recommended and have delivered at the first show in Utrecht is our 'Just Add Graphics' modular stand. With its aircraft grade aluminium structure and ability to interchange graphics as required, it was an ideal fit for their requirements. And as we are able to hire out the kit it was cost effective for them too. The stand has an integrated plasma screen, literature racks, demonstration display counters, lighting and integrated storage. We're also looking after all electrical and data requirements and managing contractors, installation and offering an on-call management service throughout the duration of each show plus breakdown, removal and storage. In addition we've developed all support materials including an animated company presentation, brochures and direct mail pieces. The Utrecht leg has been completed successfully with Gothenburg up next in April. And we know that our very own Ed Williams is looking forward to being White Van Man for the trip despite what he says!